Your sports facility or recreation center will be the heart of your community. You should keep this concept in mind from the very beginning, which means that the grand opening of your location should be a community event. When it comes time for your opening, you should involve your community to be sure that you make an impact as soon as your doors open. Sports Facilities Management can help. Today, we are offering some basic advice for organizing a successful opening ceremony. Your first step is to decide on the type of event you want to hold. You may think there is only one kind of opening event, but there is actually a variety. Your opening ceremony is a celebration of the community you live in and the role that your facility will play in your shared future. Be sure to take the time to plan an opening event that will bring the community together! Here are some broader definitions of the most common events that make up an opening ceremony. Sometimes all three of these will be included in an event, or it may just be one or two, or all three may be held on separate occasions. Most of us think of a typical ribbon-cutting ceremony when we hear “grand opening”. There is a reason for this. Hosting a ribbon cutting ceremony makes the event special and real – who doesn’t love a ribbon cutting? It gives you something to organize your event around and a great opportunity for photos. Many local Chamber of Commerce offices will have equipment and facilities to offer when it comes to ribbon cutting — including oversized scissors and ribbon for these types of events. Contact your local Chamber of Commerce to ask what they can provide. Your grand opening can also be held without a ribbon cutting. Many of the considerations and planning tips we outline below will apply to both. 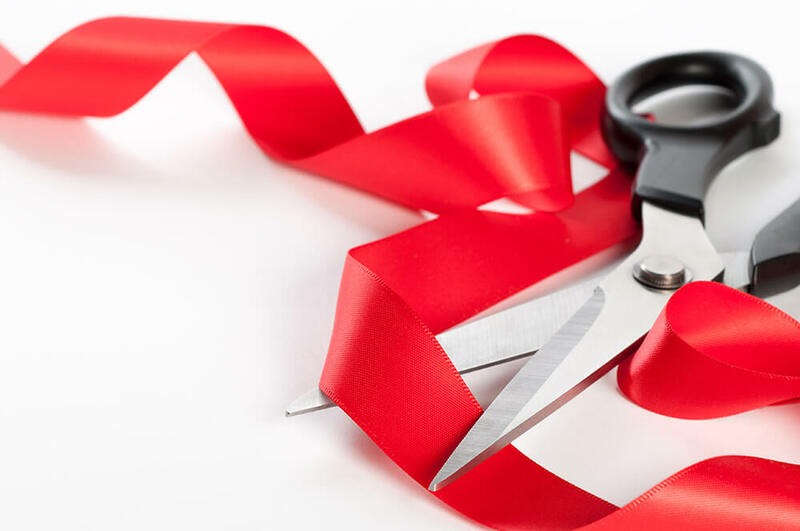 Keep in mind that a ribbon cutting adds a focal point and makes for a milestone moment, but that is not to say other celebrations cannot do the same. A reception is typical of an opening ceremony or ribbon cutting, but can also be held as a separate, unique event. If a reception is being held separately, you will need to be sure about sending out invitations. Some opening ceremony attendees are likely to assume that there are no other events without an official invite. If you do hold the reception apart from the rest of the ceremony, you can make it a more selective or exclusive event. This is an essential part of a good event budget. An opening ceremony can be promoted in a number of ways, including print media, radio, television, social media, and digital advertising. Food and drink are an important part of making sure attendees enjoy the event. The budget needed for this will depend on the size of the event. As with the refreshments budget, the planned budget for decorations will depend on the size of the event itself. Whether door prizes or other favors are part of your opening event is up to you. Keep in mind that giving away something like trial gym memberships to attendees is often an effective marketing tactic. These budget items may or may not apply to your ceremony, depending on the size of your facility and the type of opening event you want to hold. The marketing and advertising budget should always apply, and we will go over that in more detail in a moment. Of course, these are just examples of the team members who might be useful. The size, type, and location of your venue may require more or less assistance to handle the different facets of your event. As always, Sports Facilities Advisory can help with the specific details of building a team. As we mentioned above, your local Chamber of Commerce can often provide special scissors and ribbon for an opening ceremony, but they can also be a valuable resource for information. For example, if you are not sure what the best time of day to hold your event for the greatest exposure and attendance, ask your Chamber of Commerce office. Often, they can provide you with the right information to help you plan the ceremony itinerary and guest list. It may also be a good idea to invite officials from the Chamber of Commerce itself. Spreading the word about a grand opening is essential. There are many ways in which you can make people aware of the event as the date draws closer. The most immediate option is digital marketing, especially social media. For immediacy and engagement, social media has the potential to be a great resource. However, digital marketing can fail to reach the right audiences if it is done incorrectly. It can be difficult for a new business to gain any traction on social media without an established online presence. Paying for professional-grade digital marketing in conjunction with a good social media presence is much more effective than trying to go grassroots. Digital marketing will ensure your venue and event are advertised to the right people ahead of time. On the more traditional side of things, you should be alerting your local press. Contacting newspapers or specific publications in your area is an effective way of creating a broader awareness of your new venue. While not as targeted as digital marketing, your local newspapers, press, television, radio stations, and other forms of traditional media serve as a solid foundation for general publicity and public relations. If you want to make a bigger impact, you could consider inviting a celebrity to be part of your opening ceremony. Having a celebrity guest at an opening event certainly sounds like a great idea, but it is important to keep things relevant. Simply having any celebrity guest just to have a big name associated with your venue is likely to come across as a publicity stunt Invite a celebrity who is relevant to your venue and your community. If they are originally from the area you are opening in, even better. Just remember that, depending on who the person is, you may have to jump through a number of hoops in order to secure their attendance. Be ready to talk to agents or publicists a number of times and have all the details of your event mapped out and on hand before you contact anyone. If you are looking for detailed and professional guidance, staff development, outsourced management, or you have general questions about facility management, contact us today. Sports Facilities Management has provided expert services for sports complexes and event venues across the US and abroad, and we can bring this experience to you.